Everyone loves animals, some are dog lovers while some love cats and if you belong to the latter group then there is some good news for you. 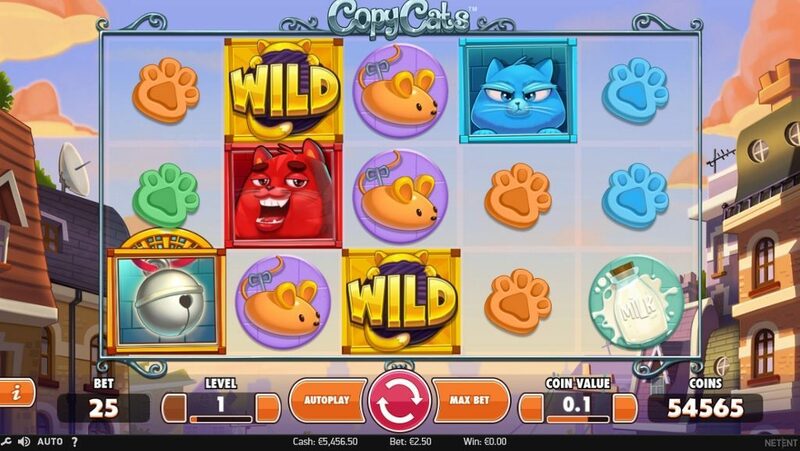 NetEnt’s latest slot game called Copy Cats slot has enough cat action on the reels to satisfy your crazy love for cats. Don’t be mistaken by the theme, although the theme glorifies cats, it also has various other elements that make the gameplay interesting too at the same time. If you like cats and love playing online slot game then this might just be the game designed for you especially, since the rewards are massive. The game might not have some serious depth when it comes to the gameplay, but it has enough elements to keep all the players entertained. The game consists of 5 reels and 25 pay lines in total. It is developed by one of the leaders in the industry, NetEnt. There are three symbols present on each reel and the players have the liberty of customizing their bet size, where they can choose up to 10 coins per pay line. The coin sizes can be adjusted by the player as well depending on their tactics, which start from 0.01 and go up to 0.5. Due to this, the maximum bet amount per spin in this game is 125, which ensures that most of the gamers stay satisfied. The theme of the game and the setup are fairly basic, considering other slot games with the same theme. The player can see a row of houses in the background of their gaming screen. The reels have various cats and cat related symbols. One of the major plus points is the design of the game, which is cartoonish. This helps give the game a lively atmosphere along with being stunning visually. The main task for the player is to get matching symbols on the reels from left to right. They should be across the pay lines. The player needs a minimum of 3 matching symbols. If they can do that, then they will win. More matching symbols they get, the more will be their payout. The symbols include various coloured paws, milk, fish and toys. The top paying symbols are the cats, that appear in three colours – blue, red and purple. The cats can appear stacked or in a single format. The wild symbol in the game is the golden cat. It replaces the other normal icons on the reels to form a winning combination. The scatter symbol in the game is the bell. It only appears on the 1st, 3rd and last reel in the game. Get all three of them on the reels and you will enter the free spins round. The free spins can be retriggered in this game. It ensures that the player plays these spins with no money. The other special feature in the game is the Copy Cats feature. If the player manages to hit a stack same cat that takes up the first reel entirely, all the other cats will turn in the same colour as this cat. This has the potential to reward the player with some massive cash. 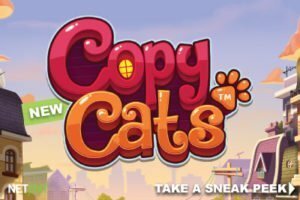 Why We Recommend Copy Cats Slot? The overall theme of the game along with the gameplay are enjoyable and fun. There are a few special features that ensure that the player gets rewarded well. There aren’t any mysterious symbols or bonus rounds. But the basic gameplay ensures that the players enjoy a normal game with their favourite cats. This slot game by NetEnt has been designed specifically to attract players that love basic gameplay. They can truly enjoy the classic slot game approach. So, if you are a cat lover and want to make some money too, do give this slot game a try.